Canisius’ baseball championship over the weekend marked the final event of the 2012-13 MAAC season (and from the ticker on the MAAC site, it’s less than 90 days until the next one starts). Here’s a look at the championships each school accumulated this academic year. I didn’t realize Marist won so many things. Part of that’s probably because they won titles in tennis and men’s rowing, which I don’t follow because Canisius doesn’t field those sports. But seven titles out of a possible 24 is impressive, especially for a school that also has an FCS football team (even if it doesn’t give scholarships). Siena didn’t win anything this year (and only had one title last year). Athletic director John D’Argenio had been there since 1993, so I don’t think he’s going anywhere, but you know, losing is bad. Manhattan and Saint Peter’s won their only titles in indoor track, competing against smaller fields (only five teams in men’s, six in women’s). Niagara and Fairfield only had one title as well, though in bigger sports. Having a good men’s basketball team leads people to think your other sports are good too; having a bad basketball team make people think your other sports are also bad. However, this basketball bias does not appear to hold true. You could have an interesting debate here on whether it’s more important for small colleges to actually have good teams or just be perceived to have good teams, but that’s another 1,000 words for another time. 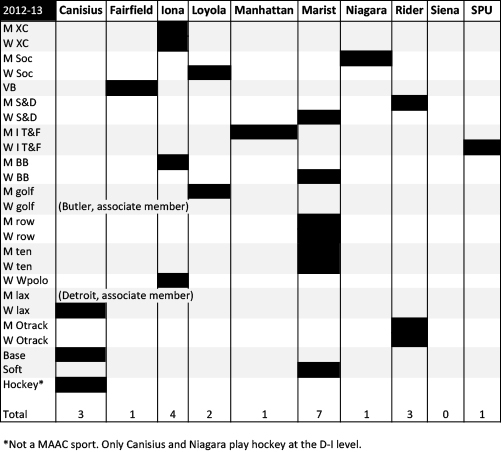 Canisius and Niagara are the only MAAC schools that have D-I ice hockey, both playing in Atlantic Hockey. I included hockey at the bottom because it’s a big national sport (in the north, at least) and Canisius just won a title, but to be fair there are schools who compete for championships in non-MAAC sports as well and I couldn’t track them all. Rider, for example, won the field hockey championship in the Northeast Conference this year, which isn’t counted in this chart. Schools who compete in non-MAAC sports are counting those titles just as much as Canisius counts its hockey championship. The MAAC awards the Commissioner’s Cup each year to the best school. It gives points to schools based on final standings and a bonus for champions in all sports. That’s different from this chart, but it looks like Marist will win that too. It seems surprising, probably because their basketball team has been in the play-in round for a few years, but according to goredfoxes.com, they’ve actually won 10 of these things. Here’s the chart for the 2011-12 year. Pretty definitive. Must be a com studies/jrn major.